If hearing the phrase “heart-healthy apps” conjures visions of low-sodium, low-fat hors d’oeuvres, you’re not alone. Most RDs would reach for their recipe box not their smartphone if they heard a client utter these words. But technology is advancing rapidly, and it’s more important now than ever to stay informed about new developments. A recent Nielson survey estimates that 50% of mobile phone subscribers own a smartphone. This mobile revolution brings with it a host of new tech tools, putting food and nutrition information at the fingertips of a large segment of the public. And this trend isn’t going away anytime soon. “Keeping in step with food and nutrition trends, RDs have to be savvy about the hundreds of nutrition apps that clients are using,” says Sarah Krieger, MPH, RD, LD/N, a St Petersburg, Florida-based dietitian. Krieger is right. There’s no shortage of versatile apps or people ready to use them to develop new health habits, track progress with exercise routines, or integrate nutrition goals into their daily life. Mobile devices are ingrained in the lives of your clients, and RDs have a professional obligation to keep up-to-date on what these tools have to offer, especially being aware of how to use them to support and reinforce nutrition education. To the techno novice, the app world can be a strange and intimidating place. The Apple App Store alone boasts more than 500,000 apps for “work, play, and everything in between.” Sifting through this massive collection to find apps that are credible, user friendly, and beneficial to clients can be daunting. 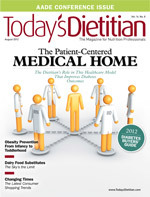 To help navigate the plethora of available apps, Today’s Dietitian reviewed its 10 top picks that support heart health. 1. MyFitnessPal by MyFitnessPal.com for iOS and Android (Free): MyFitnessPal is a great pick for clients looking for a user-friendly food diary and exercise log. Featuring the largest food database of all apps, MyFitnessPal also boasts a built-in bar-code scanner to locate individual food items’ nutrition facts. Users are given customized caloric allotments, which are adjusted based on physical activity. Downloadable reports allowing a client to view his or her history are useful tracking tools for individuals and RDs alike. This multifaceted app makes achieving and maintaining a healthful weight manageable and holds individuals accountable for physical activity, both vital aspects for strong cardiovascular health. 2. SparkPeople Diet & Food Tracker by SparkPeople.com for iOS and Android (Free): SparkPeople Diet & Food Tracker is another highly rated choice for clients who need to keep close tabs on food intake and physical activity. This app is a mobile extension of SparkPeople.com, the largest online diet and healthy living community. Instead of giving specific nutrition guidance, this app provides target ranges, which is more realistic and may feel more doable for clients who are just starting on the journey to meet their cardiovascular goals. 3. Fooducate by Fooducate, Ltd for iOS and Android (Free): This app, selected best iPhone Health and Fitness App in 2011, takes the guesswork out of grocery shopping. After scanning a product’s bar code, it gives clients a detailed nutritional description. The best feature of this program is that users are able to compare items for their health benefit, taste, and cost. While this app shouldn’t replace the RD, it provides clients with additional knowledge at their fingertips to make educated choices while food shopping. 4. Figwee Portion Explorer by Density Limit LLC for iOS ($1.99): This app boasts more than 28,000 images of numerous foods in various portion sizes. Users adjust photos to increase or decrease food quantity to observe changes in nutritional value. Going beyond comparisons to household items and the “size of the fist,” this app provides real pictures with which clients can identify. This app is great in conjunction with other food-tracking tools or as a stand-alone tool to reinforce nutrition education. Because portion distortion acts as a major factor in overeating, Figwee Portion Explorer gives clients a necessary perspective on eating appropriately and warding off weight gain. 5. Substitutions by Gormaya for iOS ($0.99): Substitutions is a wonderful app that reinforces the principles of recipe modification for dietary restrictions. This app offers nearly 60 suggestions for how to reduce sodium and fat in the diet to improve cardiovascular health, encourages clients to make better food choices, and helps foster confidence in cooking ability. 6. Runmeter by Abvio for iOS ($0.99): Runmeter allows users to download running plans ranging from a beginner’s 5 km to those for a seasoned marathoner. The app allows users to track time, location, distance, elevation, and speed. Unique attributes include enabling users to race against previous times and connect with Facebook so friends, family, and coaches can monitor their progress or send comments that are streamed live to the user during the workout. This app will challenge, support, and motivate clients to push past their physical limits no matter their level of fitness. 7. All-In Yoga by Arawella Corporation for iOS and Android ($0.99): Sporting major bang for the buck, this app gives users access to more than 300 yoga poses and 30 breathing exercises for a minimal fee. It comes with 40 preconfigured programs as well as the option to customize workouts and is a great tool for its focus on fitness, strength, flexibility, and stress relief through the meditative and calming power of yoga. 8. HeartWise Blood Pressure Tracker by SwEng LLC for iOS ($0.99): This popular app logs blood pressure and body weight, featuring the ability to generate charts and calculate other important cardiac indicators such as BMI and mean arterial pressure. Data can be exported to allow for personal and professional monitoring. 9. Sleep Cycle by Maciek Drejak Labs for iOS ($0.99): A high-tech alarm clock that analyzes movement during sleep, this app wakes users at the optimal time in their sleep cycles (within a half-hour range) to feel most rested. As research indicates, poor sleeping habits correlate with hypertension, atherosclerosis, heart failure, and heart attack. This app helps ensure the best sleep possible to fend off chronic disease. 10. LIVESTRONG MyQuit Coach by Demand Media for iOS ($3.99): Supported by experts in the smoking cessation field, this app offers a personalized plan for quitting that includes tracking cravings, motivational tips, progress charts, and access to a supportive community. Since smoking is a major contributor to cardiovascular disease, helping patients kick the habit reduces their risk of complications and premature death. — Clare T. Dyczkowski, BA, is a recent graduate of the University of Akron Coordinated Program in Dietetics. — Christin L. Seher, MS, RD, LD, is a dietitian, instructor, and nutrition consultant in northeastern Ohio.